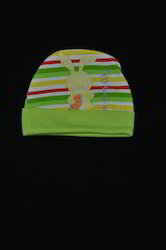 Providing you the best range of baby caps, baby mittens, baby t-shirts, infant t-shirts, kids caps and kids t-shirts with effective & timely delivery. Baby Caps available in different patterns and colours. Baby Mittens available in different colours and designs. Stripes,Plain and Printed designs are available. Fabric : 100% cotton , Interlock. 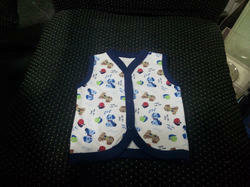 Kids T-Shirts are available in various designs and patterns. Printed,Plain with patch works and striped designs are available. Half Sleeve,Sleeveless as well as Full sleeve T-shirts are available. 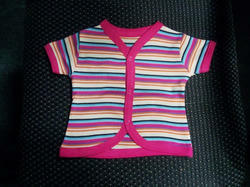 Infant T-Shirts are available in various designs and patterns. 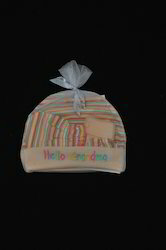 Kids caps are available in wide range of designs and colours. Plain,Printed,Stripes with or without embroidery is available. Printed, Plain with patch works and striped designs are available. 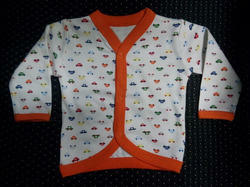 New Born T-Shirts are available in various designs and patterns. Fabirc:100% cotton, interlock, Jersey and Rib. 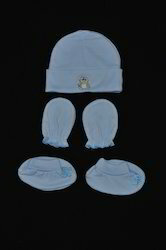 Engaged as a manufacturer, supplier and exporter, we are engaged in offering a commendable range of Baby Langoot. Trendy in looks, these products are designed and developed in compliance with the guidelines laid in the fashion industry. 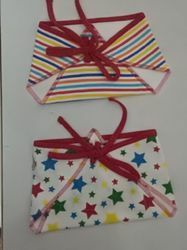 Additionally, we offer these rompers in different colors, designs and patterns. 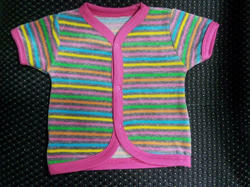 Looking for BABY CLOTHINGS ?